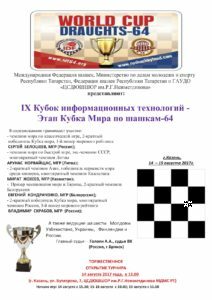 International Draughts Federation (IDF) in accordance with the Calendar of competitions in 2017 conducted from August 14 to August 19, 2017 in Kazan (Russia) the 4th stage of the World Cup 2017 – International competition «IX Cup of information technology». Competitions were held in the premises of the «TSSDYUSHSHOR of R.G. 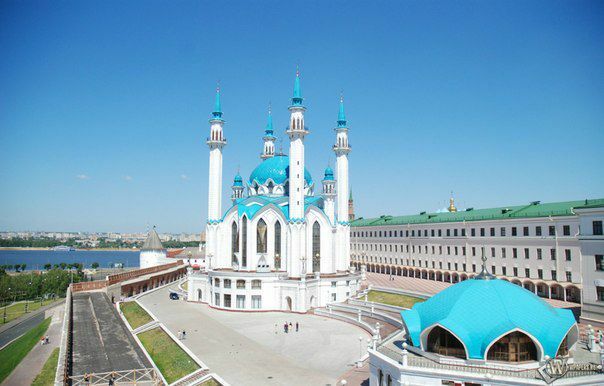 Nezhmetdinov» at the address: Kazan, ul. Butlerova, 7. Competitions were held in two programs: Classic and Blitz. International Grandmaster from Kazakhstan Mirat Zhekeev won Classic program of the 4th stage of the World Cup. International Grandmaster Sergey Belosheev won Blitz. 4) strengthening of friendly ties. 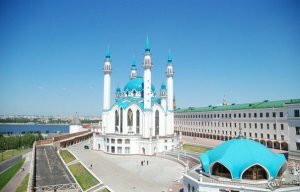 Competitions are held from August 14 to August 19, 2017 in Kazan at «TSSDYUSHSHOR of R.G.Nezhmetdinov» (Butlerov street, 7) – in front of the Kazan State Financial and Economic Institute. August 19 – 11.00 – Blitz program; 17.00 – closing of the competition (for both programs). Prizes are given only at the official closing and are not issued or forwarded in the future. Registration of all participants of the classic program is strictly up to August 9, 2017. Registration of all participants of the Blitz program is strictly up to August 18, 2017. For registration it is necessary to send on e-mail: [email protected] (or bring to the 35th office on weekdays from 9.30 to 17.00) a completed questionnaire, a scan or photo of the passport (birth certificate). Contact phone – +79173915148, (8-843)236-01-83 (Tsinman Dmitry). Participants who have not registered at the specified time (or submitted not a complete package of documents) are not allowed to participate in the tournament! The competition is open to all players, regardless of age and rating, with a sport category not less than the first, who paid entry fee and registered in the terms specified in this Regulations. The number of participants representing the country is not limited. In the Blitz program – 500 rubles for all participants. 50% of the total amount of collected tournament fees goes to the prize fund of the tournament, 50% tournament fees goes to cover the costs of organizing the competition. Competitions on the classical program are held by the Swiss system in 9 rounds with the use of a computer program for the draw with micro-matches from 4 games with the draw of the initial moves and positions on the new table approved by IDF (after the 2 played games of the micro-match, a new draw is held). Time control is 20 minutes + 5 seconds for each participant until the end of the game. Competitions on the Blitz program are held by the Swiss system in 15 rounds with the use of a computer program for the draw with micro-matches from 2 games with the initial draw and moves and positions according to the new table approved by IDF. Time control is 3 minutes + 2 seconds for each participant until the end of the game. 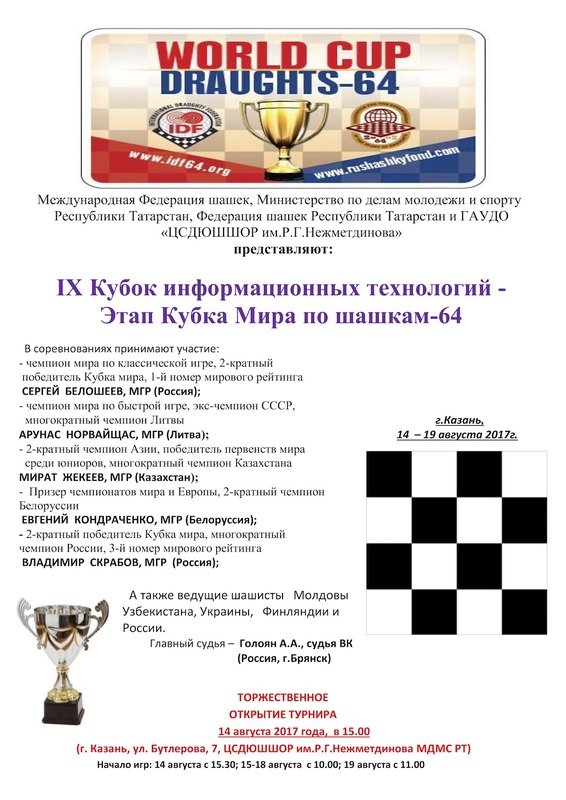 The prize fund of the tournament includes funds of the Federation of Checkers of the Republic of Tatarstan (50,000 rubles) and 50% of the total amount of tournament fees collected. The expenses related to participation in the competitions (travel, food, accommodation) of 5 foreign participants (in agreement with the organizing committee) and the Main Arbiter, as well as expenses related to the payment of the award attributes and the work of the arbiters and attendants, paid by the TSSDYUSHSHOR of R.G. Nezhmetdinov. Expenses of all other participants are at the expense of sending organizations or paid by the participants themselves. Organizing committee has reserved for participants of the tournament 2-bed rooms with all conveniences in the Ibis Hotel (43/1 Pravobulachnaya Street) for 1,800 rubles per room per day (it is 900 rubles per day per person). From the hotel to the place of the games is 10 minutes’ walk. Those participants why wish to stay in this hotel must apply to the organizing committee of the tournament before July 21, 2017. 22-08-2017 Publications about the 4th stage of the World Cup in the press are published. I express great gratitude to the organizers of the tournament! 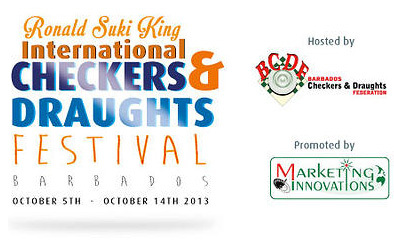 Organization, judging, competition – everything was at the highest level. Impressions from the tournament and from the beautiful city of Kazan are the warmest. I am happy to plan to come here in the future. The tournament, definitely, was a success! 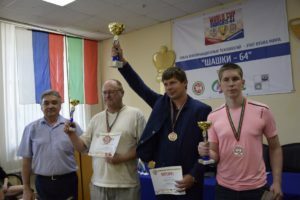 20-08-2017 International grandmaster Dmitry Tsinman sent a review of the games of the 4th stage of the World Cup. 19-08-2017 Blitz was held today. 68 players from 8 countries participated. Competitions were held on the Swiss system in 13 rounds. International Grandmaster, current world champion Sergey Belosheev became the winner of the Blitz. International Master from Kazan Denis Shogin took second place. International Grandmaster, world champion in Rapid Arunas Norvaishas from Lithuania took third place. Woman IDF Master Minina Vera became the best among women. 18-08-2017 International Grandmaster from Kazakhstan Mirat Zhekeev won Classic program of the 4th stage of the World Cup with the result of 7.5 points from 9. 2-4 places with a score of 7 points took International Grandmasters Dmitry Tsinman, Mikhail Fedorov and Vladimir Skrabov. See results. International Grandmaster, ex-world champion Natalia Fedorova took 6th place in the tournament and became the best among women. 14-08-2017 4th stage of the World Cup 2017 – International competition «IX Cup of information technology» started. 58 sportsmen from Belarus, Kazakhstan, Lithuania, Moldova, Uzbekistan, Ukraine, Finland and Russia take part in the competition.